This past June 8 was Family Fun Day at Nature’s Academy in Bradenton. Over 20 people enjoyed some truly unique activities in a beautiful setting. • a shark dissection, exploring the anatomy and physiology of the spiny dogfish. 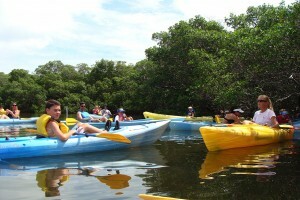 • a tour of the mangroves by kayak, where the group encountered a number of animals, including a manatee, devil rays and ospreys. • water quality testing using Vernier™ probes to measure parameters such as salinity, dissolved oxygen and nitrate levels. • using dip nets to catch seagrass inhabitants and recording each species found. During this biodiversity survey, they caught and released 19 different species! The Family Fun Day concluded with a quick coastal cleanup as a way to “pay it forward” and take home the message of environmental stewardship. The group picked up 6 pounds of litter in 15 minutes. The next Family Fun Day at Nature’s Academy will occur this fall. Watch this space for the exact date. You do need to sign up in advance by contacting Kristin@naturesacademy.org. It’s a wonderful experience for all ages. While you’re there, be sure to pick up some Nature’s Academy merchandise. All proceeds from the baseball caps, water bottles, drawstring bags and shirts fund field trips for local fifth graders, at no cost to their schools.